Bobby West has seen many things in his time as a cannabis activist and US Armed Forces veteran. Like many others suffering from PTSD, Bobby turned to cannabis after nothing else worked. Read on to learn more about his fascinating story. Hello, Bobby. How are you doing? I’m doing good. I’m heading to Michigan for the Hash Bash Street Fair, which has been going on for 46 years. The reason it started is because a good friend of mine, John Sinclair – who’s spent a lot of time in Amsterdam and is a poet, jazz singer and president of the White Panther Party – got arrested for giving two joints to an undercover police officer. They wanted to give him a life sentence. He was in jail for over a year without trial, but was released about 48 hours after John Lennon and Yoko Ono sang a song about him named ‘Free John Sinclair’. So we’re pretty excited. How does cannabis culture differ between the US and Holland? Back in the 70s, yes, they had cannabis over in Amsterdam. But in 1979, there was a merchant marine named “Old Ed”. This man would travel out all over the world to get seeds. He would take them back to California to start growing them and started bragging about it a little. This was when Ed Rosenthal heard about it and went to meet up with Old Ed. These genetics would eventually make their way around Amsterdam – from about 1979 onwards – and this is when all these great genetics started coming out. Once people got these genetics, it was only us closet growers doing it, and these closet growers are essentially some of the ones who made these genetics stable and saved them. As Amsterdam was the freest place to go for cannabis, it was the main hotspot during the 70s and 80s. Now that California and Colorado have legalized recreational use, though, these are the connoisseur fronts for everything. But it’s important to remember that the US played a major role in the genetics seen in Amsterdam today, as people from the US were studying it in the 70s and 80s. Amsterdam was a “grow closet”. What do you think cannabis culture will look like in the future? The stigma is going to be gone. I think it’s going to be more about reeducating people about this plant and its history. Anecdotally speaking and from what I’ve seen, military veterans seem to be one of the most open-minded and tolerant towards cannabis use. Could you help us shed some light on this? 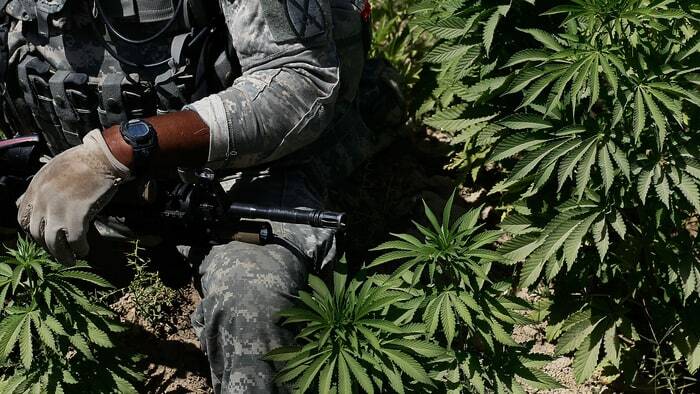 Many people in the military have smoked marijuana and not seen the harm in it. Now, with all the potential medical applications coming out about this, it’s real hard for us in the military to sit there and listen to our general and chief in charge to sit there and follow through with these orders. Once I got out, one of the first things I felt was freedom. Now these veterans are getting out, and they have problems with PTSD, loss of limbs and other problems, and they’re shoving opiates onto them. Veterans are finding that cannabis may be an answer. And of course, the Veterans Affairs (VA) being federal, they’re saying “no”; and part of our training, particularly with the way we’re treated in the military, is to go against them. I use cannabis myself for PTSD. For a lot of years, the VA was shoving all kinds of medication down our throats, and this attitude actually made me want to go out and seek other drugs in order to give me a sense of feeling. This got me onto other horrible drugs. When I got back to my hometown and started to use cannabis, my mental health improved. 22 veterans a day try to commit suicide, and it’s partly because of the way the VA treats them and the medications they are given. So, veterans are coming together, talking to each other and realizing that this plant is where it’s at. So the people in the military are seeing and hearing this … They don’t like going against their fellow brother. They don’t like seeing what happens to a fellow brother when they get out, especially when they see their access to a plant that’s helping them out restricted. Well, during the Iran-Contra affairs, they [politicians] were giving certain people guns and telling them “Go over to this country, give them guns, and they’ll give you cocaine. You can take that back to the US and sell it.” It’s a War on Drugs when it suits politicians. They’ll use it when they have something to gain. They’ll go back-and-forth on the War on Drugs. We were utterly engrossed chatting with Bobby about all cannabis-related things and beyond (including how Bobby met his wife! ).